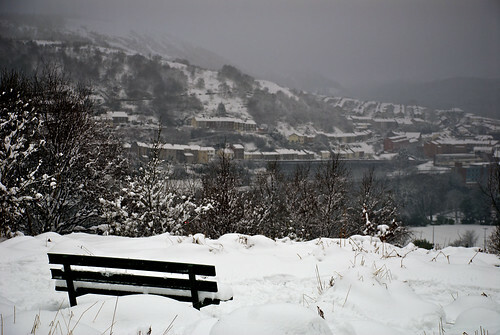 Posted by Stuart Herbert on April 7th, 2010 in Modern, Photos, Pontypridd, Turnpike / Old Road. The valleys town of Pontypridd sits at the head of the Taff Vale. Here, the valley splits into two, following the River Rhondda to the north-west and the River Taff to the north-east, where it is joined by the River Cynon at Abercynon (formerly Navigation, headquarters of the long-defunct Glamorganshire Canal). Pontypridd is enclosed on three sides … the Graig to the west, Graigwen to the north, and Ynysangharad Common to the east. All three provide great views across the town, but only the Common remains open and unspoilt by housing. This shot, taken from the Common, is looking north west towards the housing that smothers the Graig. On warmer days, it’s great to simply sit on this bench and enjoy sunny afternoons … although Ponty is normally shrouded in haze on such days. In days gone by, from here you probably would have been able to watch the flywheels turning at the Maritime Collery to the north west. Posted by Stuart Herbert on April 2nd, 2010 in Bristol Channel, Font-y-gary, Merthyr Road, Modern, Photos, Shoot, Turnpike / Old Road. The caravan park at Font-y-gary has been a popular place for the residents of Cardiff and the South Wales Valleys to escape to for an affordable summer holiday for many years. 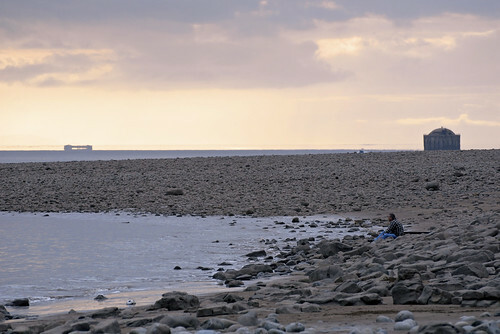 Overlooking the Bristol Channel, Font-y-gary stands above a rocky beach that affords great views to the west towards Aberthaw and the Atlantic Ocean beyond. We decided to end the weekend with a shoot down on the coast. 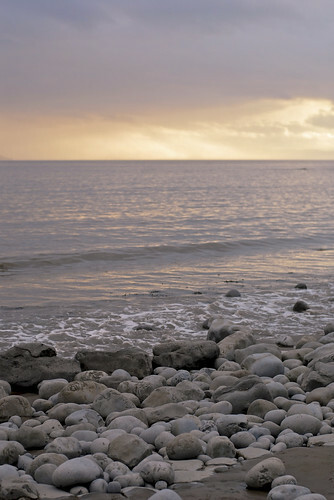 South Wales has some amazing coastline, much of which we’ve explored in previous photography jaunts, but one place we haven’t been back to since we went digital in 2003 is the coastline around Font-y-gary and Aberthaw. Sadly there wasn’t enough light (or time before the tide came in) for us to make our way along to Aberthaw too this time, but we’ve agreed to head back there soon – perhaps to try a morning shoot as everything interesting is to the west. We went out there for Kristi to get in some practice with her new Canon rig. Since she dumped her old Nikon D70 for a Canon EOS 500D (I know, I know … I tried to convince her to simply get a better Nikon, but there was no stopping her …), her photography has had a whole new lease of life. I’m just really pleased to see her getting out and about and getting her creativeness back after last summer’s car crash. Today, she wanted to practice a mix of coastal photography and sunset photography, and Font-y-gary offered both a-plenty. Whilst she did that, I had some fun of my own. It gave me a great opportunity to get some practice in with both my Nikon 70-300mm VR lens (I’m really loving its colour handling) and the Nikkor 50mm f/1.4D. To be honest, the light was crap; it was overcast, with little colour in it and little contrast. I’m pleased I managed to get anything at all from it. My favourite shot of the evening was this gentleman fishing down by the shore. I’ve no idea whether he went home empty handed or not. Right on the edge of the horizon, we could just make out this odd shape. We figured it must be a ship from the way it kept changing shape, but it certainly had us puzzled. The main reason we went down to the coast this evening was for Kristi to get some practice in at shooting coastal scenery. 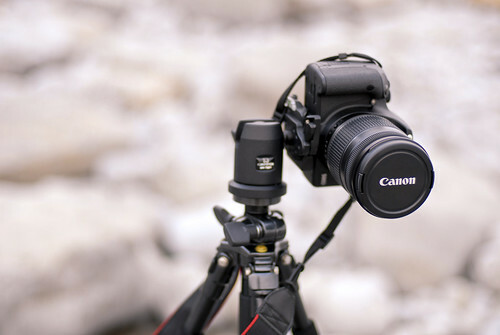 She’s recently switched from her aging Nikon D70 to a Canon EOS 500D, and has been greatly enjoying the upgrade. Me … despite the impressive features that the 500D offers (such as a truly-useful LiveView and in-camera colour curve editing), you’ll have to prise my Nikon out of my cold dead hands! Whilst Kristi practiced shooting waves with her tripod-mounted Canon, I thought I’d get some practice in of my own, playing with the amazing depth of field offered by my new Nikkor 50mm f/1.4D lens. 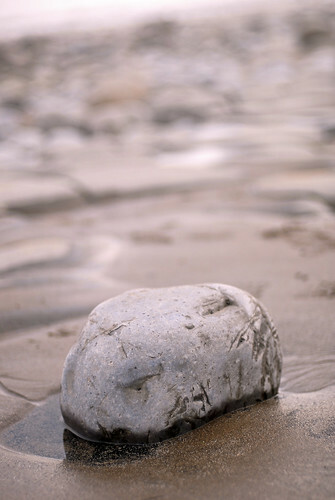 The best of these shots was this stone, all alone on the sand. With the light fading, the tide coming in, and a dodgy knee that wasn’t looking forward to the climb up off of the beach, there was time for one last photo of the sun setting out over the Bristol Channel before we left. Whilst we were down on the shoreline, Kristi showed me how she could adjust the colours that her Canon EOS 500D saw through what she said was the white balance controls, although it looked more like a colour curve system to my eyes. Either way, it looked like she could drag some colour out of the sky in-camera – something my Nikon D200 simply can’t do. (I admit it; there are some things a Canon is better at. Glass isn’t one of them though 🙂 ). Back at base, I remembered that Aperture 3 now includes a curves tool, and this seemed to be the perfect opportunity to play with it and see whether or not I could bring a little more colour out of my own photos from the shoot. Post-processing isn’t as good as in-camera, and the curve tool isn’t quite as intuitive as the 500D’s in-camera control, but hopefully you’ve enjoyed these images. More practice required though! Posted by Stuart Herbert on May 7th, 2007 in Egwlysilan, Modern, Pontypridd, Shoot, Turnpike / Old Road, Walking Routes. View the Unofficial Taff Vale Eastern Ridge Walk as part of my Merthyr Road project on Flickr. 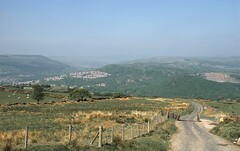 High above Taff Vale, Eglwysilan Road runs south from Pontypridd to Nantgarw. On a sunny day, the route makes for an excellent – if exposed – walk down Taff Vale to the Taff Gap. Along the way are the summits of Cefn Eglwysilan and Mynydd Meio with their radio transmitter towers, and the ancient settlement of Eglwysilan itself, a former seat of power in the valleys. There are also excellent views west into the Taff Vale (provided you get up there early enough before the sun shifts to the west!) and also east into the Rhymney Valley and down to Caerphilly. It’s May Bank Holiday weekend overe here in the UK, and what better way to enjoy the sunny weather than a hike up Cefn Eglwysilan and a gentle stroll down the eastern side of Taff Vale to Nantgarw? It took me about an hour to hike up from Pontypridd, and then another four hours or so to wander down to Nantgarw, taking plenty of photos along the way. According to Sheet 171 from the cassini.com Old Maps series, Eglwysilan Road has been there at least since the late 1700’s, and it seems likely that the route has existed in one form or another for centuries before then. Eglwysilan Road used to run up from Nantgarw to Cilfynydd, but at some point in the last seven years the route north from Pontypridd has been deliberately blocked with boulders. Even before the boulders were added, the route was only passable in something like a Land Rover. The walk started at Ynysangharad Common, Pontypridd, where the road heads up towards Pontypridd Golf Club. Once I’d cleared the houses, the first real view I had was of the Hanson Aggregates quarry at Craig-Yr-Hesg, and a look back down towards the communities of Trawlln and Graigwen. I ignored the turn-off to the right for the Golf Club, and continued up the steepening track. Although it’s a single track road, it’s quite heavily used by cars, vans, walkers and the occaisonal jogger or two. At last (for my suffering right knee at any rate!) I broke clear of the trees and reached the cattle grid that officially marks the northern end of Eglwysilan Road. Even if you go no further, the hike up to this level affords lovely views towards Abercynon, the blocked off greenway route, and back down towards Pontypridd. If the steep walk is too hard on you, why not drive up to the cattle grid and enjoy both the views and a much gentler walk up at this level? From here, Eglwysilan Road runs south along the ridge line, and that was my eventual planned route. But first I hiked up the last slopes towards the summit, taking in another view of Abercynon, and also a fantasic view of the head of Taff Vale with the Rhondda Valley behind it. My objective was the three radio masts up on the summit of Twyn Hywel. At 382 metres at sea level, it stands at the same height as its twin 800 metres or so to the south, Cefn Eglwysilan. On 8th January 1974, at 2:39pm, the Receive (Rx) tower collapsed at this site. There’s a trig point on Cefn Eglwysilan, and from here I enjoyed another great view of Pontypridd, and also a first look at the University of Glamorgan. I was also able to snag a nice shot of one of the surviving sheds from the old Treforest Tin and Iron Works. (I’ve published some of my shots from inside the old tin works in an earlier article; there will be more articles about the tin works later in this series). I found the walking up here fairly easy going, with no real problems for an able-bodied person. There hasn’t been much rain at all so far this year, which has led to the ground being unusually dry. I suspect that in previous years the ground would have been quite boggy in many places! From the trig point on Cefn Eglwysilan, I made my way back down to Eglwysilan Road, which afforded a great view down the valley towards the Taff Gap. Unfortunately, I was shooting into the sun to get the shot, but hopefully it provides some idea of just how narrow and cramped Taff Vale really is. There were many sheep grazing up on the hill, and although most of them ran off as I made my way south along the road, I managed to capture this curious lamb and also this grazing sheep with the Treforest Tin and Iron Works in the background. I also bagged this fantastic shot of the University of Glamorgan’s main campus buildings. Sheep were everywhere, mostly out in the blazing sun, although some had the sense to hide away in the shade. Eglwysilan Road crosses a few streams along the way, and in one of those I spotted something odd. I couldn’t make out what it was on the day, but looking at the photograph now, it was either a child’s stuffed toy (which is what Kristi believes it probably is), or a poor unfortunate animal (which is my guess). Blink and you’d miss it, but Eglwysilan was a seat of major power in South Wales for centuries. The ancient parish ran from Taffs Well, Castle Coch and Thornhill in the south, Pontypridd in the west, Cilfynydd in the north, and Caerphilly in the east – totaling some 12,000 acres. William Edwards, builder of the famous bridge that gave Newbridge (now Pontypridd) its name, and one of the contributors to the maintenance of the church building at Eglwysilan, is buried in the graveyard of the Church of St Ilan alongside his wife. The graveyard is also home to two ancient yew trees. Both trees were reported in 2006 to be leaning dangerously, and may need propping in order to preserve them for future generations. The church building has been dated back to at least 1200 AD, and it may stand on (or near) the site of a monk’s cell. Associated with the church is a story about a 17th century priest who encouraged the newly-deceased to be buried with their valuables – which, along with his two daughters, he duly robbed. During the English Civil War, it is said that Parliamentarian troops used the church as a stable for their horses. Immediately after the cargo container, I took the steep path up to the top of Mynydd Meio. There’s a trig point up here, affording a great view north back to the masts on Twyn Hywel. There are also radio masts on top of Mynydd Meio maintained by Surf Telecoms, but they lie inside fenced-off farm land, and I was forced to make my way back down to Eglwysilan Road by following the fence. 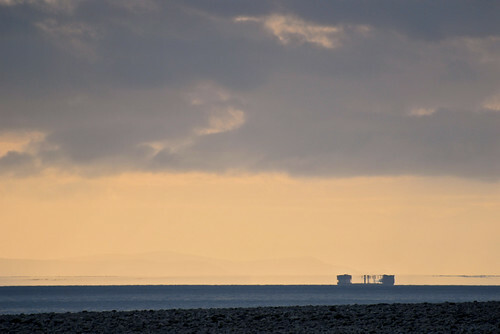 The masts could be seen from the road as I continued on the way south. The BBC website contains a video of the folk story The Banshee of Mynydd Meio, by Huw Davies. Mynydd Meio is also a popular place for handgliding, and is included in Caerphilly’s plans as part of the UK Biodiversity Action Plan. (See also Caerphilly’s Countryside and Nature conservation plan). After heading past yet more sheep, the hill to the east opened up to give a first view of Caerphilly, and a lovely view of the modern-day settlement at Nantgarw. Here, the hill started to descend down to Nantgarw, heading past the site of a former colliery (whose name I don’t yet know), which I’m guessing is what this curious red post is connected to. There were picturesque blossoms to admire, and then the end of the road – Nantgarw, and a bridge over the Taff Trail. From Nantgarw, it was an easy walk down the Taff Trail to Taffs Well Railway Station at the old Walnut Tree Junction, where anyone else who’d like to try this walk can hop on a train back up to the starting point at Pontypridd. All in all, I had a very relaxing walk in great weather (I have the sunburn to prove it! ), and I’d strongly recommend that this is one walk that you should get out and do for yourself at some point (maybe the upcoming Bank Holiday at the end of May? 😉 ). I wouldn’t recommend this walk in windy or wet conditions. The top of the Mynydd Eglwysilans are exposed, and in poor visibility I’m sure they’re quite dangerous. I took something like 175 photos on the day, which I whittled down to the 55 that have been published on Flickr. Here are my favourite photos from those 55. This shot of the style, taken south of the village of Eglwysilan, is the photo I’m happiest about colour-wise. Although I like the composition and the way that the detail in the wood has been picked up by my Nikon D200, it’s the colour of this photo that I’m really drawn to. Of the 55 photos I uploaded, this is one of only 3 where I didn’t edit the colour at all. I tried it with the desaturated style that I’m currently favouring, but it looks so good unedited that I just didn’t want to change it at all. With the almost total lack of rain we’ve had recently, hill fires have been a big problem this year. On the way up from Pontypridd, my eye was drawn to this fence post which has survived just such a fire. I love the way that the fire damage has brought out the pattern in the wood grain, and I think it contrasts nicely with the green shoots beyond. One of the things I really enjoyed about this walk was the sense of openness once I’d made it up above Pontypridd. With its narrow terraced housing all crammed around the A470 (and, before it, the Glamorganshire Canal), Pontypridd can feel as constrained as it feels spacious up on the hills. This photo (along with the photo that opens this article) does a great job of capturing that feeling. Despite the vingetting from the 18-135mm camera lens, I’m drawn to how empty this simple shot is. All there is is the vast sky above Mynydd Meio and the radio masts at Twyn Hywel in the distance to the north. What could be more relaxing than that? The 18-135mm lens makes up for is contribution to the previous shot in this shot of Pontypridd. There’s an enormous amount of detail in this photo, and that’s largely thanks to the amazing sharpness that this lens can produce. Nikon forums on the web are already calling the 18-135mm lens a classic, and when you view this photo at original size, you’ll see why. It’s working out that, for every hour I spend out there taking photographs for the Merthyr Road project, I spend another hour writing the blog article, and another hour creating the write-ups for the photographs published on Flickr. Not too bad when it’s a short set of photos, but for all-day trips like Trevithick’s Tramroad and now Eglwysilan Road, it can take all week to get an article published. So, this week, I’m trying something different. Instead of hiding my photos on Flickr until the write-ups are done, I’ve published them straight away. I’ll work on the write-ups during the week, and when they’re complete I’ll let you know with a blog posting. I’ll also update this blog posting as I go along with the list of sources used for this article and the photos. Speaking of sources, that’s another area where I’m trying something different. I’m currently evaluating DEVONthink Pro from Devon Technologies, along with its sister product DEVONagent. I like the idea of having an offline archive of the web pages used as sources for these articles, especially one that’s searchable and easily classified. On top of that, the Pro Office version includes OCR technology, which might allow me to make a searchable archive out of my rapidly growing collection of books about the South Wales Valleys. Unfortunately, when I searched for Eglwysilan on Flickr, nearly all the photos that turned up were mine from this shoot! (All the photos for Twyn Hywel and Mynydd Meio were mine, too). I’m wondering if I need to do workshops in the local area to explain what Flickr is and how to upload photos to it? There’s a surprising amount of information available about Eglwysilan, considering the modern-day settlement is little more than a church, a pub, and a couple of houses. From it, a lot can be learned about the communities of Taff Vale below. A full list of sources will be provided as I make progress on adding write-ups to the photographs. Slaters Commercial Directory, Pontypridd, Glamorgan, 1880, on GENUKI. Pupil teachers from the Rhondda Training Centre on a geological expedition to Craig Yr Hesg Quarry, circa 1900, from the Rhondda Cynon Taff Photographic Archive. Company Information: Hanson Aggregates South Wales Ltd on manta.com. Viscocel Bitumen Modifier Pellets, a press release by Excel from 2003. About Pontypridd, on the C r Meibion Pontypridd ~ Pontypridd Male Choir website. Teenager injured in quarry fall on the BBC News website. Boy rescued after 3am quarry fall on the BBC News website. Madeleine Gray at SCARAB Research Centre at UWCN. Pont yr Hesg, on the Cistercian Way. Pontypridd Page on Harry The Trout’s Home Site.